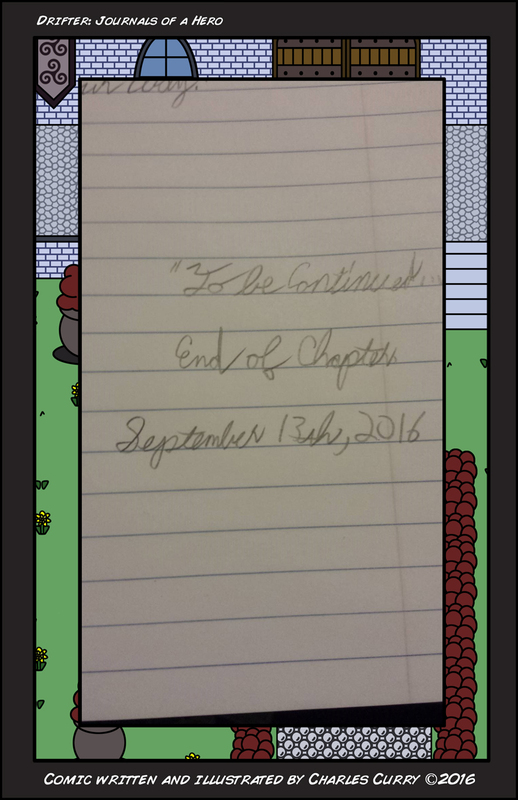 This picture shows that tonight I finished scripting the next Chapter of the Drifter comic series. This is a huge deal to me right now because I began the script April 12th, after a bummer experience at SUPER!BitCon in OKC and an event that really got me down in the dumps that following week. It should never had taken me 5 months to script a chapter of the comics and I should be in the middle of posting Chapter 11 right now or close to finished. Unfortunately an event in my life in early June pushed the Pause Button on getting any progress done on the comics and sent me into a rough depression that I couldn't really find much motivation to continue working on the comics or much of any artwork in the process. I was worried this would bother people that like to read the series or scare away any new potential readers I might have picked up from New World Comic Con in July. But after support from friends, I'm getting better in my personal life and do realize that these kinds of things happen to other Artists and Web-Comic Authors from time to time. I've had to take care of myself for a while now, but it looks like i've picked myself up, dusted myself off and things are looking better from here. I'll begin work on drawing pages towards the end of this week and should hopefully have an update soon on when to look forward to the next exciting Chapter of Drifter: Journals of a Hero. Cheers! © 2009 -2018 Charles Roy Curry III. All rights reserved.